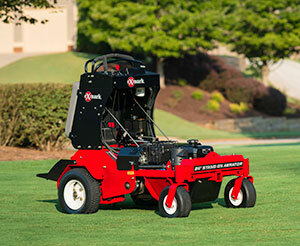 Exmark recently introduced its 24-inch stand-on aerator. “We designed the 24-inch aerator to make quick work of small or gated properties. Because it fits through 36-inch gates, the new machine brings stand-on productivity to properties that used to require a walk-behind machine,” said Lloyd von Scheliha, Exmark product manager. The increased efficiency of the dual-hydro drive system reduces horsepower requirements, while offering speed control up to 6.8-mph. The Smart Controller tracks machine hours and provides maintenance reminders, while also providing a clear LCD screen, advanced settings, service resets and electronic depth control. The electronic tine depth control offers easy tool-less adjustment of tine engagement from 0.5-inches to 5.0-inches, in half-inch increments, to allow for consistent core depth across a property. The foot activated hydraulic tine control frees the operator’s hands to control the machine. The hydraulic down force is set by the operator to provide increased stability and operator comfort. Exmark also added isolation bumpers into the operator platform to reduce bumps and vibration felt by the operator.